Virat Kohli is an admired cricketer all around the world and gathers fans in big numbers for himself wherever he goes. 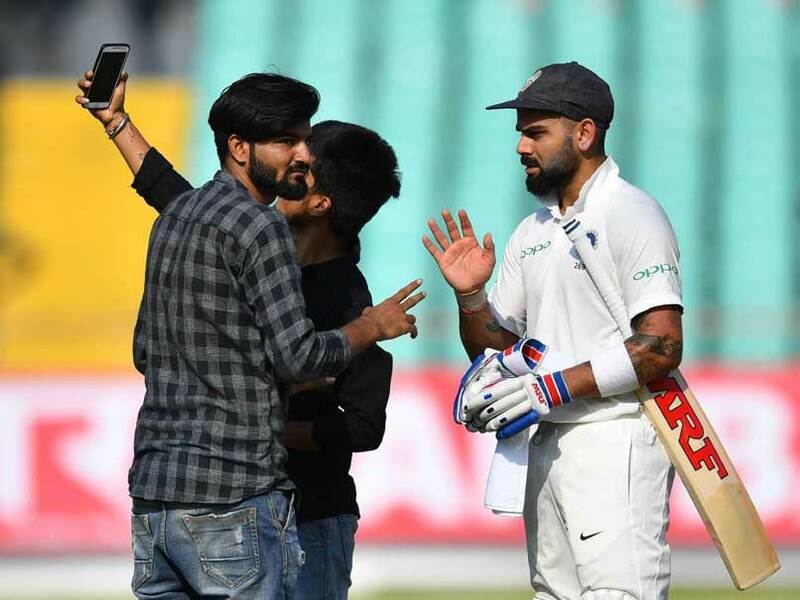 On Thursday, Virat Kohli was surrounded by two pitch invaders during the Day 1 of the first Test against the Windies at the Saurashtra Cricket Association Stadium in Rajkot. 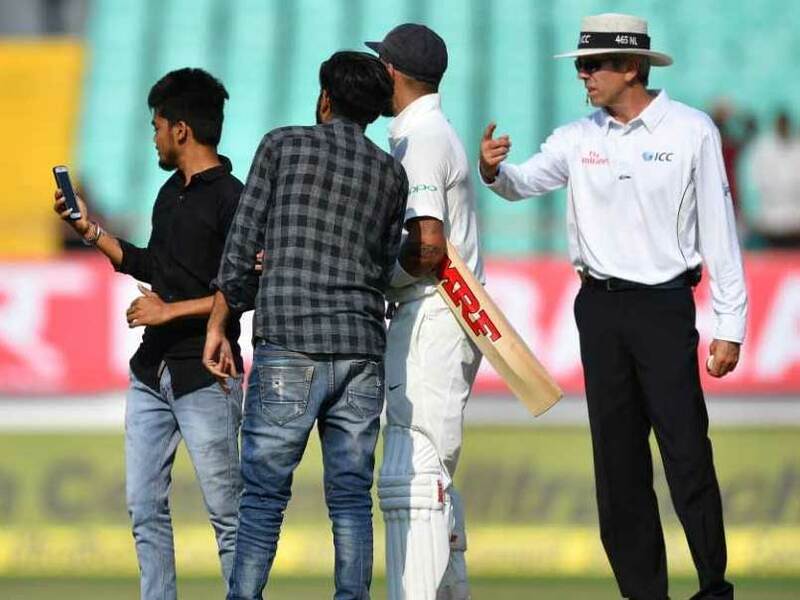 The pitch invaders were captured taking selfie with Virat Kohli, when he walked out to bat. 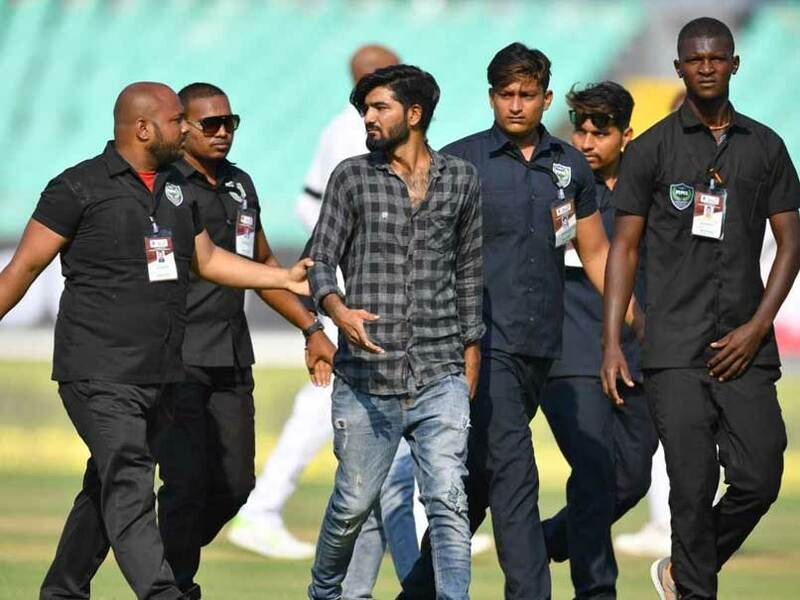 The fans were later escorted out of the field by the security personnel. At stumps, Kohli remained unbeaten on 72 runs from 134 balls. His knock was laced with four boundaries and no hits over the fence. At stumps on Day 1, India held the upper hand, posting 364 runs at the loss of four wickets. Virat Kohli will resume the proceedings on Day 2 alongside wicket-keeper batsman Rishabh Pant, who is unbeaten on 17 runs. Earlier in the day, Prithvi Shaw, 18, took the cricketing world by storm as he notched a century on debut. After India won the toss and opted to bat, Prithvi Shaw (134) played a well-composed innings on top of the order to put the home side in the driving seat. In doing so, Prithvi Shaw also became the youngest Indian to score a Test century on debut. He achieved the feat at the age of 18 years and 329 days. Shaw was also involved in a 206-run second wicket stand with one-down batsman Cheteshwar Pujara (86). For the Windies, Shannon Gabriel, Sherman Lewis, Devendra Bishoo and Roston Chase scalped a wicket each on the opening day.